Historically, most brands have been marketed on their performance characteristics. “Our toothpaste is better than yours.” We’re better at “whitening teeth,” “preventing cavities,” or giving you “fresh breath.” Positioning was the name of the game in brand marketing. But positioning is no longer enough in our highly competitive markets. Just consider marketing to millennials, one of today’s largest demographic groups. Millennials have high expectations for brands. Millennials live in a world filled with constant problems – air pollution, bad drinking water, crimes. Many would like brands to show concern not just for profits but for the communities they serve, and the world we live in. In fact, more and more, we see a yearning for jobs that have a higher meaning than profit-making. The Body Shop was one of the first companies to broadcast its ethical values and beliefs. Its founder and CEO, Anita Roddick, not only wanted to make really fine skincare lotions but also care for “animal rights,” “civil rights,” “fair trade,” and “environmental protection.” Many Body Shop clients said they were mainly interested in her products but many more approved of her activism and often gathered to march together for the causes they shared. Using this definition as a starting point, we can envision a framework that allows a business to develop an activist strategy. We should be clear in saying that activism doesn’t have to be progressive; it can be regressive as well. 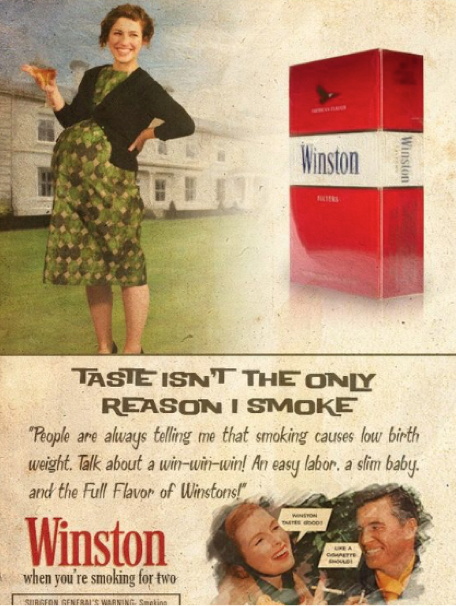 The poster-child for regressive activism is the Big Tobacco – the tobacco companies that for so many years denied the harm their products did to consumers, even when their own research revealed otherwise. 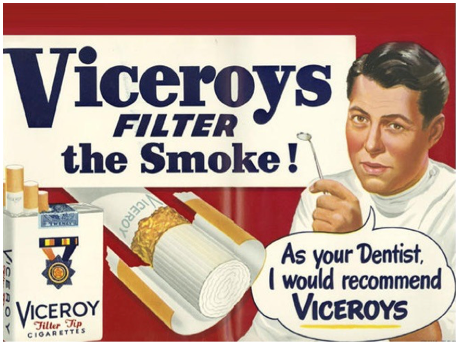 They promoted the “virtues” of smoking in a way that actually hurt consumers. Companies that lobby our politicians for regressive policies are brand activists. On the progressive activism side, we see more and more companies seeking to have an impact on the biggest societal problems. These companies have a larger purpose than simple profit-seeking, and are increasingly seen as leaders in their fields. The rankings weigh long-term financial results at 80% and ESG (environmental, social, and governance) performance at 20%. On the basis of purely financial metrics, Amazon’s Jeff Bezos leads all other CEOs, but Amazon’s relatively weak ESG score places him at #87 overall. When did brand activism become a thing? It’s a natural evolution of the Corporate Social Responsibility (CSR) and Environmental, Social and Governance (ESG) programs that are transforming companies across the world. Previous efforts were identified as marketing-driven and corporate driven initiatives. Brand activism emerges as a values-driven agenda for companies that care about the future of society and the planet’s health. The underlying force for progress is a sense of justice and fairness for all. 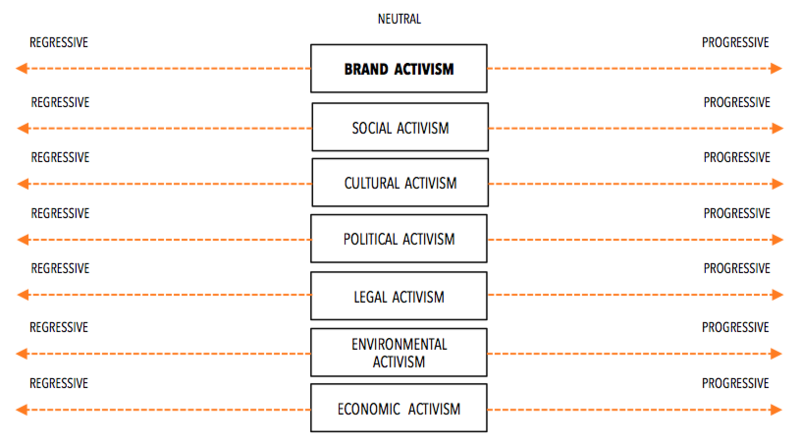 So what domains or categories come under the umbrella of brand activism? Different industries have different norms, but even within industries such as oil and gas, for example, there will be leaders and laggards in each domain. It would be an interesting and meaningful exercise to measure and rank all businesses by industry with clear indicators of where they stand. It might be even more interesting to measure their long term success in the market as well. Let’s look at a few examples of companies that are taking brand activism to new heights. These are brand-activist leaders in a field that is growing rapidly. The Refuge – Patagonia promotes a short film on their website about “one of America’s last wild places and the people who call it home.” For hundreds of generations, the Gwich’in people of Alaska and northern Canada have depended on the caribou that migrate through the Arctic Refuge. With their traditional culture now threatened by oil extraction and climate change, the Gwich’in women are continuing a decades-long fight to protect their land and future. Watch the video below, and see their petition. radically///resourceful – 100% recycled down, polyester and wool. This season Patagonia introduces a new line called re\\\collection—styles made with all sorts of recycled materials, including 100% recycled down, 100% recycled wool and 100% recycled polyester with 85% recycled polyester labels, 80% recycled zippers and 50% recycled buttons. Fair Trade – Patagonia pays a premium for every Fair Trade Certified item that carries their label. That extra money goes directly to the workers at the factory, and they decide how to spend it. The program also promotes the workers health, safety, social and environmental compliance, and encourages dialog between workers and management. Regenerative Organic Agriculture – Patagonia is working to incorporate regenerative organic practices into its supply chain—and work collaboratively with other companies and organizations to further this important work. For a 60-second look at how regenerative organic agriculture works, check out Dirt Cheap. For a deeper dive, take a look at Unbroken Ground, a recently-released 25-minute film by Chris Malloy on the work of four different groups to help create higher-quality food that is far more nutritious and delicious than anything industrial farms can produce. Unilever also co-developed a Circular Business Model, or CBM, that aims to link up all material flows in an infinite process circle in order to use resources most efficiently and ideally don’t create any waste. 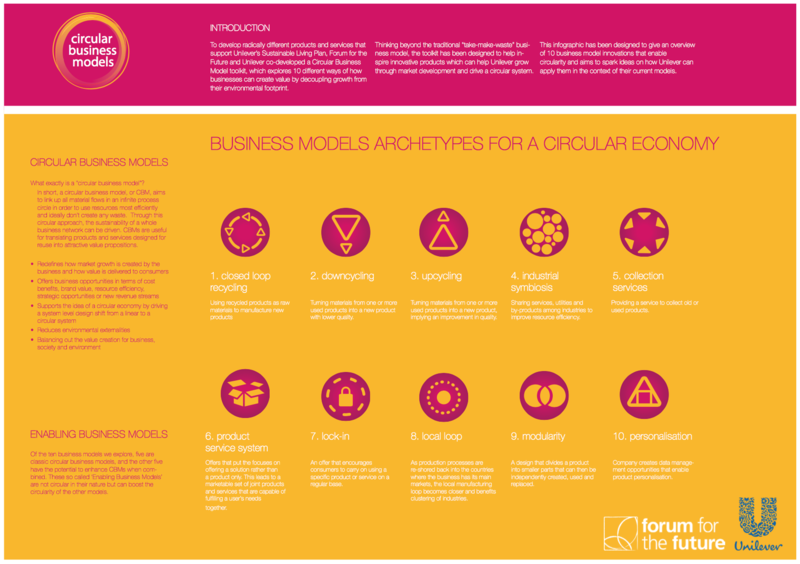 Through this circular approach, the sustainability of a whole business network can be driven. CBMs are useful for translating products and services designed for reuse into attractive value propositions. In 1988, Ben & Jerry’s was one of the first companies in the world to place a social mission in equal importance to its product and economic missions. Ben & Jerry’s operates on a three-part mission that aims to create linked prosperity for everyone that’s connected to the business: suppliers, employees, farmers, franchisees, customers, and neighbors alike. Since being acquired as a separate division of Unilever, Ben & Jerry’s has grown and now has a unifying set of principles and criteria on which to evaluate socially responsible businesses, it’s called the “B Corp” movement (or Benefit Corporation movement). Certified B Corps satisfy a rigorous set of standards to achieve certification. 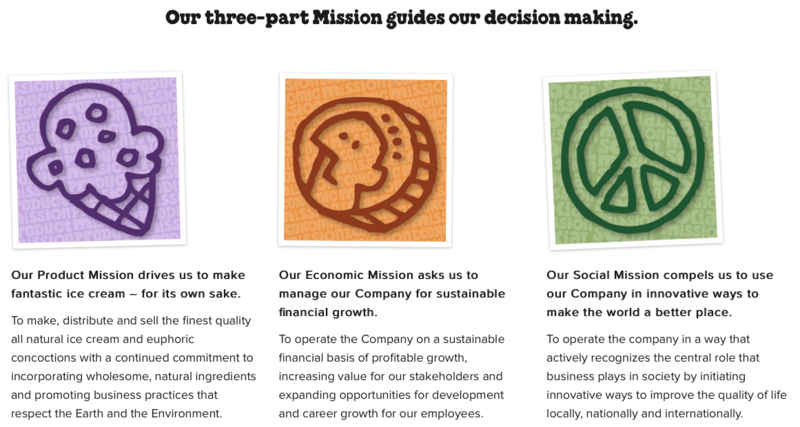 Ben and Jerry’s became the first-ever wholly-owned subsidiary to gain B Corp Certification. Specific activist issues supported by Ben and Jerry’s include: Democracy, Climate Justice, GMO Labeling, LGBT Equality, overturning Citizen’s United, Fairtrade, opposing rGBH, and Peace Building. In 2016, Ben and Jerry’s publicly announced their support for Black Lives Matter and opposition to systemic racism. In many ways Ben and Jerry’s is a justice-brand – taking a stand for social issues most businesses avoid by design. Seventh Generation, another Unilever subsidiary, is also B-Corp and a mission-driven company. The mission – to inspire a consumer revolution that nurtures the health of the next seven generations – is based on the Great Law of the Iroquois – which holds it appropriate to think seven generations ahead (about 140 years into the future) and decide whether the decisions they make today would benefit their children seven generations into the future. Many of chemicals in products we use in our homes and around our families are not listed on the label. That’s why we’ve redirected our passion prioritizing your right to know what’s in the products you buy. In January, we hosted a rally of mothers, janitorial workers, NGO’s and progressive business on the Statehouse steps in California, kicking off our #comeclean campaign calling on legislators to require cleaning products to fully list ingredients they contain on their label and online. Our economic system of Capitalism is both praiseworthy and blameworthy at the same time. We need to acknowledge that worldwide Capitalism has lifted many out of extreme poverty. But almost half the world — over three billion people — still live on less than $2.50 a day. While we have seen substantial worldwide growth in basic education and literacy and health systems, there is much to be done. Capitalism is also blameworthy. There is no justification for 62 persons in the world owning as much wealth as half of the rest of the world. Our companies have historically practiced “pirate” Capitalism aims at making the rich richer. Peter Drucker, in his early writings, saw companies not as our oppressors but more as our possible saviors. He developed the idea of management as a science. Companies would be run by enlightened managers who pursued profitability and sustainability and rewarded all the stakeholders. Drucker saw business management and unions working together as our bulwark against instability – both fascism and communism. He saw companies not as our threat but as our salvation. This can’t happen unless more of our companies go through a transformation. CEOs must become servant-leaders, not emperors. Workers need to be represented on the company’s Board of Directors, as in Germany. Companies must formulate a set of principles and values to guide their behavior. Much of the answer now lies in whether more of our companies can adopt a new set of values that go beyond just making profits for their stockholders and managers. The problem with industrial capitalism today is not the profit motive; the problem is how the profit motive is usually framed. There is a persistent myth in the contemporary business world that the ultimate purpose of a business is to maximize profit for the company’s investors. However, the maximization of profit is not a purpose; instead, it is an outcome. We argue that the best way to maximize profits over the long term is to not make them the primary goal. Will companies embrace brand activism? Elsie Maio, a leading Business Values guru, helps companies undertaking a process of soul branding or spiritual awakening. We see this happening in a handful of companies around the world. What kinds and how many consumers are likely to care about our company’s level and type of activism? Will consumers believe that our company authentically and passionately believes in the cause(s) we support? Will the cost of implementation require us to raise our prices? Will our consumers be willing to pay a little more? 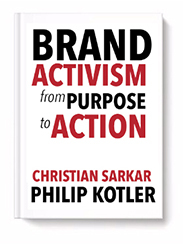 Does the governance structure and executive leadership understand how and why brand activism makes a difference? How does our activism make us a workplace of meaning to engage and inspire our employees? Also needed is a way to recognize and award those companies that practice sustainable, stakeholder-oriented business management. Perhaps we need to set up a Brand Activist Award for Business and each year cite and award certain companies as being leaders in brand activism. Our hope is that more buyers will make their purchases from activist brands, in recognition of their enlightened business practices.